Given how important domain controllers are within the IT environment we think it’s pretty important they’re properly monitored. You need to know at all times the state of Domain Controller and how it’s performing. However, it’s not always practical to run such tasks using just command line. 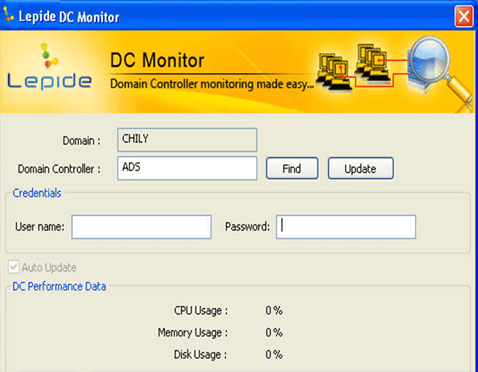 The Lepide DC Monitor is one our freeware tools that take the pain out of domain controller monitoring. It determines the state of Domain Controllers and their performance. It also makes it easy for the administrator to monitor multiple domain controllers from a single place. Auto Update function allows administrator to check continuous data changes. Provides complete interaction between Domain Controller and its utility. What will this solution monitor? CPU utilization, Memory Utilization and Disk Utilization . Page Reads/sec, Page Writes/sec, NTFRS Handles, File Reads/sec, File Writes/sec, etc.